This interactive presentation contains the latest gas production data through February this year from all 3,539 horizontal wells in Louisiana, that started production since 2007, with most of these wells (>90%) being located in the Haynesville basin. In several dashboards I’ve pre-selected only this basin. 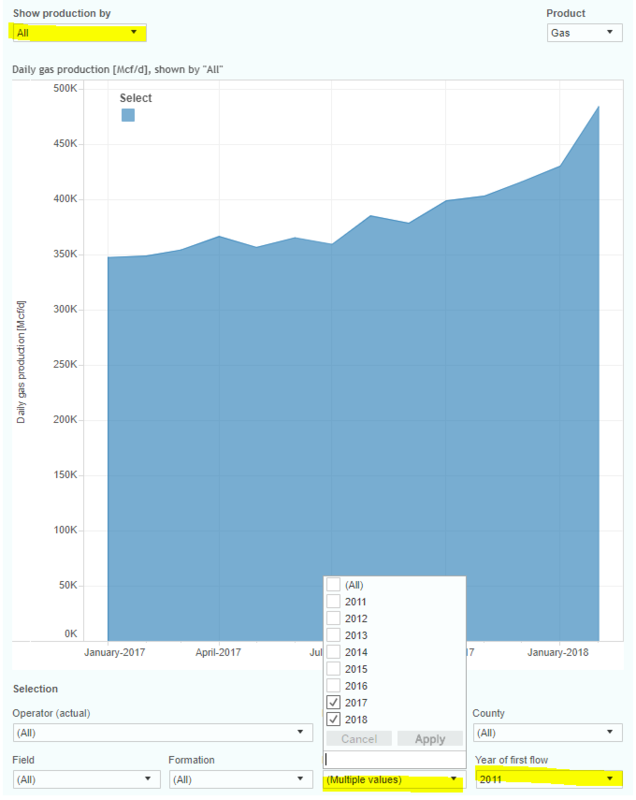 As shown in the above graph, gas production rose by about 50% in 2017 to over 4.5 Bcf/d, as more wells were completed, their initial productivity was higher, and several older wells were again stimulated. Data for especially the last 3 months may be revised significantly. Although still relatively small (< 1 Bcf/d), several operators have started to access the Cotton Valley formation in Lincoln parish in recent years, and production there has grown rapidly (you can find this area on the map in the “Where?” overview, just northeast of the Haynesville basin). In the “Well quality” tab the changes in the production profiles over the past years are visible. 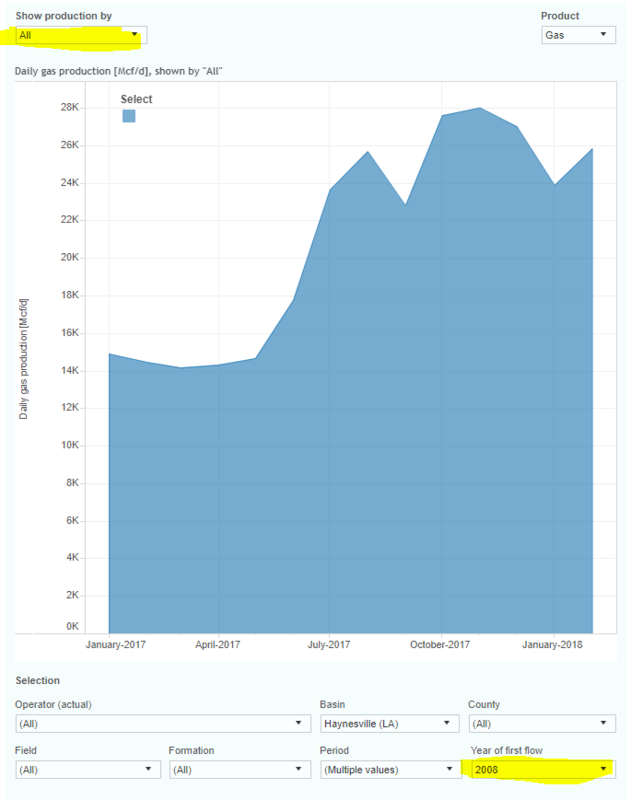 As the bottom graph shows, a typical well that started in 2015 recovered 3.7 Bcf in the first 20 months on production, versus just over 5 Bcf for a well starting in 2016. Major factors behind these changes are longer laterals (up by over 10% over this period), and more proppants (higher by more than 50%!). The average completion in 2017 used 20 million pounds of proppants, double the amount that was used 2 years earlier. The largest operator in this area is Chesapeake, with more than 1 Bcf/d of operated production capacity, as the last tab shows. This “Ultimate Return” overview shows the relationship between production rates, and cumulative recovery, over time. Wells are grouped by the year in which production started. For more recent and granular data you can set the ‘Show wells by’ selection to ‘quarter’ or ‘month of first flow’. The graph makes clear that the drastic changes in well completion designs in the past few years had a strong effect. It is not uncommon now for a well to recover 5 Bcf before the first 1.5 years on production, while many older wells have not even reached that level yet. 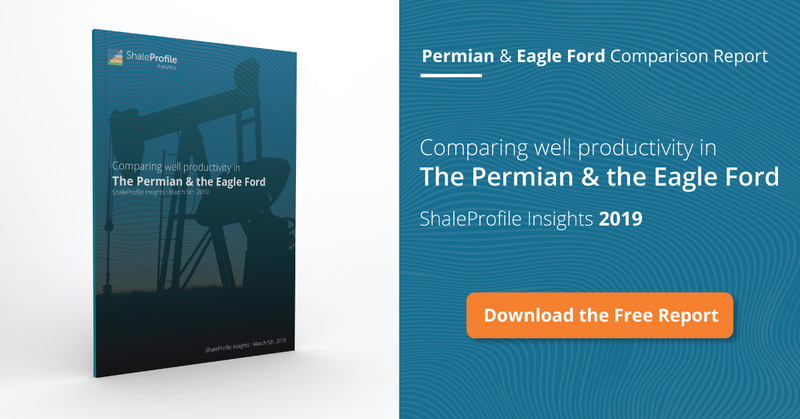 In the ‘Productivity ranking’ overview, operators are ranked by the average performance of their wells, as measured by the amount of gas recovered in the first 2 years. BHP Billiton and Vine are some of the top performers, although this ranking changes slightly if you either change the measurement period, or only look at more recent wells (using the ‘Year of first flow’ selection). I expect to have a new post on the Eagle Ford in the 2nd half of next week. I will delay my post on Pennsylvania to around the middle of June, when production data for Ohio is released as well. You can follow us here on Twitter. I really believe they are drilling longer laterals. Can you confirm? I think the laterals were like 5,000 ft. and now more are 10,000 ft. Indeed laterals are getting longer, a trend seen in all basins. In 2013 the average was 5000 feet for a new lateral, while recently this figure is just below 8000 feet. Although higher IP and first 5BCF in 1.5years are partly due to longer laterals, I would like to point out that the other positive factor. The 1st year decline rate of reduced from previously almost 65% in 2009 to over 50% in 2013&2014, and now under 50% in 2016. This certainly compares positively to some other plays where higher IP does not come along with reduced decline rate, indicating improved EUR due to completion technology improvement is real, and the “depletion of sweet spots will dominate” as some worried is not happening at least here in Haynesville. Thanks Nuassembly, that’s indeed an interesting point. I really believe that the lower decline rate has to do with the chocking of these wells. Operators have chocked these wells. If they let them free flow like they did in early versions the decline would be the same. As data plots above shown, IP 90days also increased significantly, even more than the average increase in lateral length. The choking management is an arguable issue right now, as some operators in Haynesville suggested that producing at 1/3 or less of maximum IP might help EUR. But the majority of the operators in Haynesville obviously are not adopting this, judging from the plots above. It will be great if Enno could also present the available reported maximum IPs here. Why is the production suddenly increasing again? Looks like they’re re-fracing wells from 2008 to 2012. Production is going up in each of those years. Wells older than 2012 show no signs of re-fracing. Production from 2012 is dropping up until 2017 then it takes off again. If you look at the graph I posted and set the show production by “All” and year of first flow to 2008, then 2009, then 2010, etc. You’ll see what I mean. Sorry forget the period, set it to 2017 and 2018. Here is a graph from 2011.